Sometimes you want a cookie, but you also want something relatively healthy. A lot of products try to fulfill that narrow window of need, but few succeed. Rawxies definitely does. These raw, vegan and gluten-free snacks are made from spices, nuts and fruit, and are just sweet enough to double as a snack or dessert. They’re perfectly chewy, and let’s be honest: It doesn’t hurt that they come in the shape of a heart. We loved the Banana Nut and Mint Chocolate Chip flavors the best, but they’re all good! 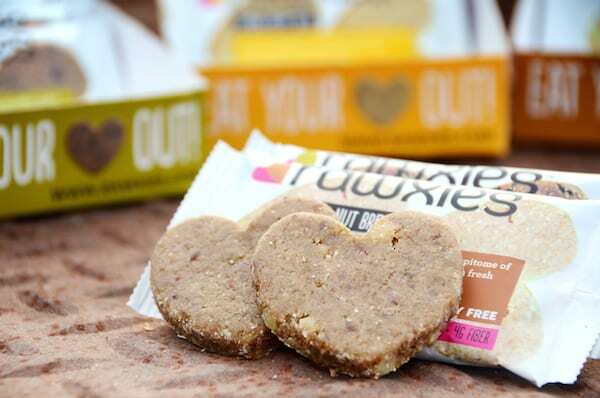 Rawxies is a snack food company that celebrates pure and natural ingredients. Our truly great tasting recipes are consciously prepared to protect the integrity of the ingredients we source, offering an unparalleled taste experience. Rawxies offers snacks that appeal to not only people on special diets, such as gluten-free, dairy-free or vegans, but to all who seek incredible tasting products made from pure natural ingredients. Rawxies is committed to sourcing the highest quality ingredients and also delivering the freshest, best taking products safely to customers. Oh My Veggies readers who order Rawxies online will get 15% off through July 15, 2015. Simply enter the code OMV15 at checkout.